Aerospace Maintenance Chemicals Market size was valued at over USD 7 billion in 2017 and is estimated to exhibit over 3 percent CAGR from 2018 to 2024. Rising air passenger traffic, flight frequency and government regulations pertaining to passenger safety and security has increased aircraft repair activities and will fuel industry growth during forecast period. In 2016, the International Air Transport Association (IATA) registered 7% increase in air passengers as compared to 2015 with additional 242 million air trips. Decreasing air fare and improved middle class living standards has enhanced tourism business and will boost aerospace maintenance chemicals market share from 2018 to 2024. Ongoing refurbishment activity to ensure proper working and upgrading aircraft cabins will escalate product demand. Increasing crude oil price has swelled fuel efficient airplane demand as these modern aircrafts offers 15-20% enhanced efficiency compared to their counterparts. Better fuel efficiency will encourage commercial airplanes manufacturers to amplify the flight iterations to accommodate the air passengers demand. These factors will enhance the market from 2018 to 2024. Aircraft companies including Airbus and Boeing are constantly improving their manufacturing capacity sufficing the rising aircraft demand. For instance, in 2018, Boeing has planned to increase Boeing-747 production by 52 aircrafts per month to cover the backlog of 4,656 airplanes enhancing the product demand. In 2017, the global commercial aviation industry had production backlog of over 17 thousand and will require around 10 years to overcome this at current manufacturing rate. Continuous rise in airplane production will in turn drive the aerospace maintenance chemicals market size over the forecast timeline. Issues such as inventory management may restrict product growth as these require proper storage facility with adequate temperature and humidity. Further, adverse chemical effects on labour due to long duration exposure can limit its usage. Rise in organic aerospace repair products will overcome these hinderances and fuel the market growth during forecast period. Aircraft cleaning segment will witness around 2.9% CAGR with utilization for both interiors and exterior of airplane to enhance customer experience. Rise in air passengers and consistent aircraft iterations degrade interiors and require cleaning ensuring cabin hygiene. Aircraft cleaning service providers are expanding business with focus on reduced service time, adhering to ground time schedule, weather conditions, and developing customized specialty services that will enhance aerospace maintenance chemicals market growth. Commercial aircraft segment accounts for over 45% share owing to global aviation sector growth. Increasing travel and tourism demand will further augment the repair products for multiple applications such as cleaning, degreasing, and paint removing. Business aircraft aerospace maintenance chemicals market will exhibit significant growth rate during forecast period. This can be credited to the need of leather cleaners to ensure higher aircraft soft goods life as these planes use high-end leather materials in the interior parts and seats. Consistent cleaning of helicopters improves its service life, preventing it from oxidation processes such as corrosion that degrades product strength. Cleaning the dirt and grease will offer superior performance. Regular overhaul requirement of helicopters is anticipated to fuel aerospace maintenance chemical market from 2018 to 2024. 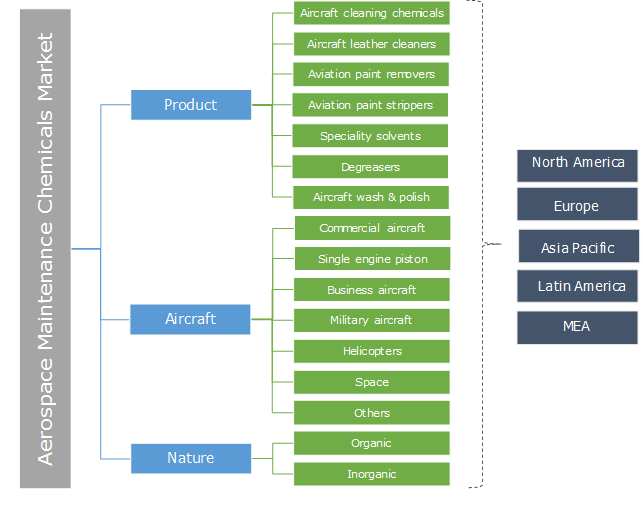 Organic aerospace maintenance chemicals market will account for over 60% share till 2024 owing to faster operations coupled with labour safety. Harmful diseases including CANCER, motor neurone disease and multiple sclerosis has increased the usage of organic products. Suitable viscosity of the chemical is highly preferred to ensure labour friendly MRO process. Rising demand for toxic-free chemicals and a stringent regulatory framework will drive the aerospace maintenance chemicals market. Regional regulatory bodies, including European Aviation Safety Agency (EASA), Registration Evaluation Authorization & Restriction of Chemicals (REACH) in Europe and U.S. Federal Aviation Administration (FAA), are amending the requirements associated with chemical usage in repairing procedures. Industry players are investing heavily in research activities to manufacture advanced products that comply with the regulations. North America leads the aerospace maintenance chemicals market with over USD 2 billion in 2017, exhibiting 2.5% CAGR till 2024. This can be attributed to vast expansion of aviation industry coupled with rising investments in military and defence sector. The U.S. has planned to increase military spending by 13% as compared to 2017 that in turn will boost military aircraft production. Further, growing air fleet will propel maintenance operations in this region. Europe led by France, Germany, and UK will witness significant growth with rise in passenger traffic. Improving product performance with cost-competitiveness are the key factors for overall aerospace maintenance chemicals market growth. Increasing number of private jets and business aircraft in the Middle East will influence industry growth over the projected time span. Aerospace maintenance chemical market is highly fragmented with well-established players such as Dow Chemical Company, Shell, Eastman, and ExxonMobil. Other players include 3M, Aerochemicals, Aircraft Spruce and Specialty Co, Arrow Solutions, Aviation Chemical Solutions, Callington Haven, Florida Chemical, Henkel AG & Co. KGaA, High Performance Composites & Coatings, Hypercoat Enterprises Pte Ltd., Klean Strip, KLX, Krayden, McGean-Rohco, Nexeo Solutions, NUVITE Chemical Compounds, Pexa, Sil-Mid Limited, Socomore, Wesco Aircraft Hardware Corp, W.W. Grainger, and Chemetall. Companies are investing heavily in research activities to develop their repair procedures and reduce overall MRO cost. The major manufacturers of aerospace maintenance chemicals market join hands with customers to maintain the demand & supply of the industry. Presence of synthetic materials in the product need to be compliant with the stringent government regulations are creating pressure on the manufacturers to modify their products accordingly. Stringent regulations will offer better control over the toxic products that are in high demand. Aerospace maintenance chemicals are used in the aircraft interiors and exteriors to ensure surface finish and low wear. Product manufacturers are indulging in long term agreement with maintenance, repair & overhaul (MRO) service providers for continuous service. Regulatory governing aerospace maintenance chemical market include SAE (Society of Automotive Engineers) International govern usage of materials and processes for aircraft overhaul operations. It provides standards for cleaning airplane turbine engine components, paint removal and cleaning aircraft exterior surfaces.